I met Dionne Dean last August at a Grapevine Mills Fall Fashion preview. She had recently moved to Dallas and was starting her own styling business. Just over a year later, this exceptionally stylish woman is living her dream, and I could not be more proud! Dionne is gifted not only as a fashion stylist, but in finding unbelievable bargains. Her motto is “We never pay retail”– and I can attest to her skills. Earlier this week, she pulled some looks for me from Refabulous Resale and I left with a gorgeous two-piece suit from White House Black Market, blazer from Forever 21, multiple shirts and dresses for only $30 total. 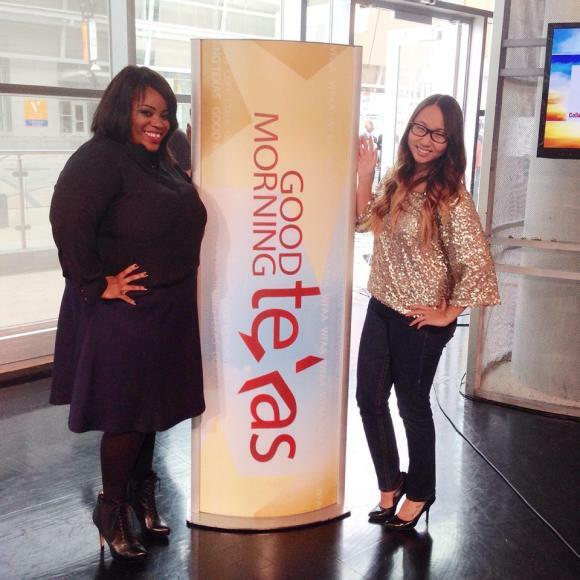 Dionne invited me to join her on Good Morning Texas yesterday for a segment about Nail Trends for fall. In addition to being a stylist, Dionne also has experience as a nail technician. She talked about all the latest trends from at-home gel manicures to nail art, and glitter! I’m wearing an outfit she styled me in– a gorgeous gold sequin dolman top with skinny jeans. Perfect for date night or ladies night! Watch her Good Morning Texas segment below to find out which nail trends you should rock this season.